On Father’s Day is a devastating and powerful book by Megan Norris that tells the definitive story of one of the worst Australian crimes of recent years. In 2005, Victorian father Robert Farquharson’s car – with his three little boys in it – veered into an icy dam. The children, Jai, 10, Tyler, 7, and Bailey, 2, all died and the traumatic impact of the tragedy made headlines around Australia. The children’s mother Cindy Gambino (pictured below with the author) was left completely broken by the crime and, at first, believed her ex-husband that it was a tragic accident. But Farquharson’s crime is the most extreme, and little understood, example of family violence – the murder of children to punish the mother. It took seven years, two trials and three appeal hearings (Robert Farquharson was jailed for a minimum of 33 years) for this story to finally be heard and it contains details never before revealed in the trials or media coverage. Norris, who worked for many years with Cindy Gambino to tell this story, has written the story with such detail and narrative power that the reader is compelled to continue reading, even though the content is so tragic. There are also the stories of other women whose children have been murdered by their fathers in revenge killings intended to punish them forever. 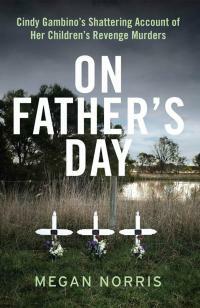 On Father’s Day is published by The Five Mile Press and available from all good bookstores.